Kim de Jong was born on June 8, 1977 in Alkmaar. In 1995 she graduated from the Bertrand Russell College in Krommenie and started studying Psychology at the University of Amsterdam. In 2000 she received her master degree (‘met genoegen’), in Clinical Psychology and in Psychological Methods. For her master thesis, she translated the Outcome Questionnaire (OQ-45) into Dutch and collected preliminary data on the psychometric properties of the OQ-45. She also did a combined clinical and research internship at polikliniek Ypenstein in Heiloo (GGZ Noord-Holland-Noord). In October 2000 she started working as a researcher at GGZ Noord-Holland-Noord. During the first few years she combined this job with teaching at the Hotelschool The Hague (research methods and statistics) and the University of Amsterdam (research practicum). She continued to collect data on the OQ-45 which eventually resulted in writing the manual for the Dutch OQ-45. At GGZ Noord-Holland-Noord she mainly performed health services research, which was used for internal reports to inform management on different aspects of the quality of care. 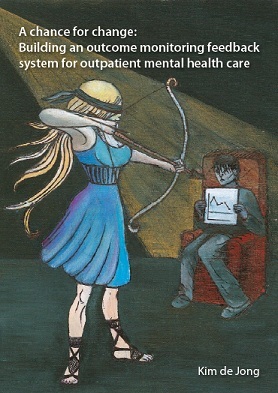 She performed studies in a wide variety of patients and settings, including inpatient crisis care, crisis home care, elderly inpatients, adult and forensic outpatients and severe mental illnesses on a great variety of topics, including patient requests, patient needs, satisfaction, dialectical behavioral therapy and brief solution-focused psychotherapy. In 2006 she started working on her dissertation part-time, as an external candidate, linked to the department of Clinical, Health and Neuropsychology of Leiden University. The results of her dissertation research are presented in this thesis. Starting September 2008, she visited Michael Lambert’s research group at Brigham Young University for 5 months. In October 2009, she took on a part-time job as a researcher at the department of Medical Psychology and Psychotherapy at the Erasmus University Medical Center on the Monitoring Psychotherapy study. The results of that study are included in this thesis. She currently works at both GGZ Noord-Holland-Noord and the Erasmus University Medical Center. In addition to her regular activities, she has taken part in many additional professional activities, including being the coordinator of the OQ international researchers collaborative and being a student representative in the educational committee of the Dutch-Flemish Postgraduate School in Experimental Psychopathology. She is currently an associate editor for the Dutch Journal of Psychotherapy (Tijdschrift voor Psychotherapie) and she was a member of a national task force on routine outcome monitoring (werkgroep Vergelijkbaarheid, project ROMggz). She is also very actively involved in the Society for Psychotherapy Research.